Getting a cut in the kitchen is both the worst and best place to break the skin. Worst because the uncooked food is nearly always covered in bacteria. Best because soap and water are nearby. 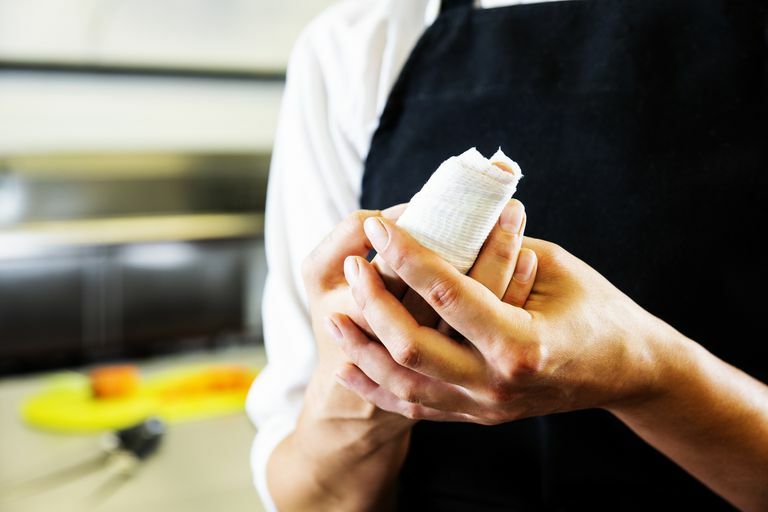 If you cut yourself during food preparation, infection is your worst enemy. Luckily, soap and water are all you need to clean a wound, even a wound covered in bacteria. Whether it's an emergency or not depends on how long, how deep and where the cut is. First, let me say that finger cuts are almost never life-threatening. When talking about emergencies at the finger level, we are more worried about the loss of function or the loss of an entire finger. Larger cuts—across the palm, for example, or cutting off (amputating) multiple fingers—do have the potential of being deadly. If the bleeding is severe (not just oozing) or blood is squirting, then immediately take steps to control bleeding and call 911. Also, if you've amputated any part of a finger, call 911. Both of those are considered real emergencies. You most likely are not going to die from a finger laceration, but time is essential for the survival of the finger. Wash with soap and water. There are all kinds of disinfectant products out there, but nothing works better than plain old soap and warm water. Encourage the blood to ooze out of the cut for a few minutes. As long as the blood isn't pouring out like a garden hose (see the part about emergencies above), then you should squeeze out a little extra. Blood oozing from the inside to the outside helps to flush out any bacteria that can cause infection. Squeeze out the blood under running water over the sink. Control bleeding. Be sure to wash it first! You don't want to wash the site after you stop bleeding because that will wash away the scab and start the bleeding over again. Plus, if you're going to squeeze out a few extra drops, you'll need to be done with that before you make it stop. If the patient feels weak or dizzy, call 911 and treat for shock. It's always better to be safe rather than sorry, but it's still probably not life-threatening. Some folks will pass out simply from the pain or the sight of blood. And before they pass out, they feel weak or dizzy. Have them lie down before they fall down. Once the bleeding has stopped and the wound is clean, you can dress it with an adhesive bandage. After you but a bandage over it, put a glove on that hand if you still have food prep to do. Use an exam glove or a plastic serving glove. Don't put any antibiotic ointments or creams (such as Neosporin) on the cut until you are done in the kitchen. If the cut is a centimeter or longer and you can see tissue below the skin, it may need stitches. One way to test it is to pull the edges apart. If you can, then the cut is probably worthy of a trip to the emergency room or urgent care center. Does Super Glue Heal Minor Cuts and Scrapes?